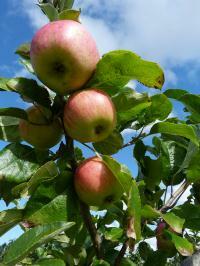 This is a good time of year to plan the position of new fruit trees, and order the trees. Our stocks are limited, and our trees are now growing so that they will be ready for delivery in their dormant period, this year from late November to late March. If you order now, the trees will be reserved for you, ready for delivery in late November/early December. A tree is different from a conventional product that you can buy say at a supermarket because it follows the rhythms of nature. From late October a tree begins to prepare for the winter shut-down. Carbohydrate reserves built up in the leaves are sent down to the root system for storage. The tree then sends all the substances it wants to get rid of to the leaves (contributing to their autumn colours) so that leaf drop is like a purification process. By late November or early December, metabolism has reached its minimum throughout the tree. As the spring approaches, the root system uses some of its reserves to rejuvenate its micro-feeding roots, tiny, microscopic rootlets invisible to the naked eye, the structures that do the job of absorbing water and nutrients from the soil. And so by the start of April the tree is ready to start its new season. This is why we recommend planting from late November to late March. It is a mistake to think that when the trees are put in the soil they start to grow from that moment. Trees need time to adjust and closely associate with the soil, in order to rebuild the micro-feeding roots. This process can take as much as from 3 weeks to a month, depending on soil temperature. What happens if you plant a tree at other times of year? However gently you transplant, the micro-feeding rootlets are all destroyed. For about a month, the trees are totally dependent on the reserves stored in the thicker roots and in the woody parts of the tree above ground. Once those reserved are used up, the tree starves, and will look miserable for the rest of the season. So, in summary, order now, ready for deliveries from late November!